The "Magic Inch" System has been a Carey's tradition for over 50 years, with over 1,000,000 sold. The "Magic Inch" is an air chamber inserted between the imported briar bowl and the vented mouthpiece which allows cool outside air to enter and mix with the warm tobacco smoke inside the "Magic Inch" chamber. Tobacco tars, oils and moisture, are squeezed out of the smoke. The residue drops to the bottom of the chamber and is absorbed by the Papyrate sleeve. From its rich tradition and thousands of satisfied customers, this pipe is sure to be your smoking favorite for life. To learn more about the "Magic Inch" System click here: "Magic Inch System"
"The magic inch pipe is the best on the market because of the unique filter system. I won't smoke any other pipe." 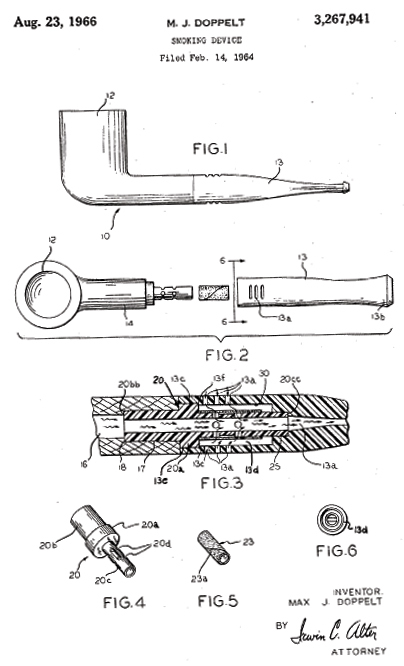 "There is no other pipe that I have ever found that smokes as well as the famous E. A. Carey Magic Inch pipe. These pipes always stay cool and dry after repeated use." "Carey pipe is a great buy. Smokes cool from the start. Good value for the money." "For pipe smokers, the Carey Magic Inch Pipes are the best tasting, with less tongue burn, and greater smoking satisfaction. They are long lasting and deliver the best pleasant smoking sensation. Have smoked them for 35 years or more, and they continue to deliver the best taste."